A perceived lack of talent does not hold you back, what holds you back is believing that talent is the same as desire, dedication, discipline. Do you believe that people who are great at what they do were born that way? If so, it’s a convenient method of letting yourself off the hook, isn’t it? You’re giving yourself a pass on focusing on something you want to be good at. Like jazz piano or darts. Does that sound harsh? It should, because it’s true. There is no such thing as talent and the world would be a better place if the word “talent” didn’t exist at all because too many people think “talent” is the holy grail for getting good at something. You know what talent really is? Talent is being able to make a decision and then dedicate yourself, commit yourself, and do whatever it takes to get to where you want to be with that decision regardless of hardships involved. When someone cops out with the talent excuse, it immediately turns me off. I’d rather hear, “I just don’t have the time because I need to watch four hours of TV every night.” That’s honest. Or maybe, “I’m not really interested in something that takes more than a few days to learn.” That’s honest too, sad, but honest. The really sad part is that every time you use the term “talent” in an excuse about why you can’t do something, it’s another pebble in the pail, a reinforcement to use that same old “talent” crutch again and again, and it’s going to hold you back until the day you die. There is a bright side to this story. 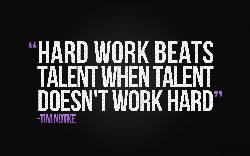 The talent excuse is just as easy to ignore as it is to use. You want to learn something or get a project done? Piano? Photography? Writing? Dedicate 15 minutes a day. People spend more time than that popping zits. Write the book, learn guitar, paint pictures, learn photoshop, do pull ups, whatever you want to excel in, start with 15 minutes a day and be amazed at how fast you progress. Here are some guidelines for getting good at something. I guarantee you will see progress if you focus on your goal and follow these guidelines. That means no day dreaming or “having fun” with it. Instead it means focused concentration on the problem or technique you have decided to tackle. This means forget about the big picture and work on the small things. The big picture is often overwhelming because of how much information and how much time it will take to be a master. There’s a great book called “Mastery” by Robert Greene that talks about how various people who shaped history (DaVinci, Mozart, Einstein and others) became masters not as a result of genius or talent, instead they became masters as a result of time put in and intense focus. Part of working on the next step is to keep your focus on small things. One technique at a time. One note at a time, one brush stroke, one stanza, keep the focus on the very next thing that needs to happen to make the step after happen. This focus on the details is the best way to get good at something fast. One of the things that really separates the people who get good at things and the people who don’t is finishing. It’s easy to start a project. I can start sixteen projects in one day. It’s when you finish something you started that you feel the real glory. First, other people for the most part don't want you to try something because it reminds them that they aren't trying things themselves. You may have people get angry at you for taking something new on simply because they are jealous, even if it's only on a subconscious level. Taking this advice is also a hall pass to not trying, an easy out. If you’re going to try to do something, why even consider that it won’t work out? Don't worry about it, worrying doesn’t help you with your goal. It’s normal to hit roadblocks and walls when learning something new or working on a project, in fact, if you don’t hit a wall at some point you’re probably not challenging yourself enough. The only thing a problem means is that it’s time to approach your goal from a different angle. Quitting at the first sign of difficulty does nothing but put you back in the lazy chair. Masters have a knack of making what they do seem easy. When I play piano, it looks easy. When a circus acrobat flies through the air, they make it look easy. Bruce Lee made kicking a hanging lamp 6 feet above his head look easy. Why do things look easy when experts do them? Experts make things look easy because they are experts. They put the time in to master something. No one got good at anything in a weekend. Do you follow the the dusty path in the valley of mediocrity or do you follow the path less traveled and walk the ridge line of success?